“Granddaddy ate them by the bucketful,” said his daughter, Rachelle. I know for a fact that my Mom’s cousins, Mary Lou, Angela, Phil, Jeannie, and Paula will all be making them on Christmas Eve this year. I have good memories of going to my Auntie Terry’s house on holidays and eating them. I’m talking about fried cauliflower. We are a family that loves fried cauliflower and fried celery, broccoli, and carduna, if we are lucky enough to source it. This is truly a family favorite. When my children gush over something I’ve made, as they do over fried cauliflower, and then ask me how to make it, I know it is time to blog it. I want the next generation of adults to learn the family recipes. Here is my grandmother’s recipe as given to me by Mom’s sister, Auntie Terry. Fill a medium-large pot with 3 quarts of hot water. Add 2 tablespoons of salt. Bring to a boil. Add florets and bring to a rolling boil. Allow to boil vigorously for 1½ minutes. 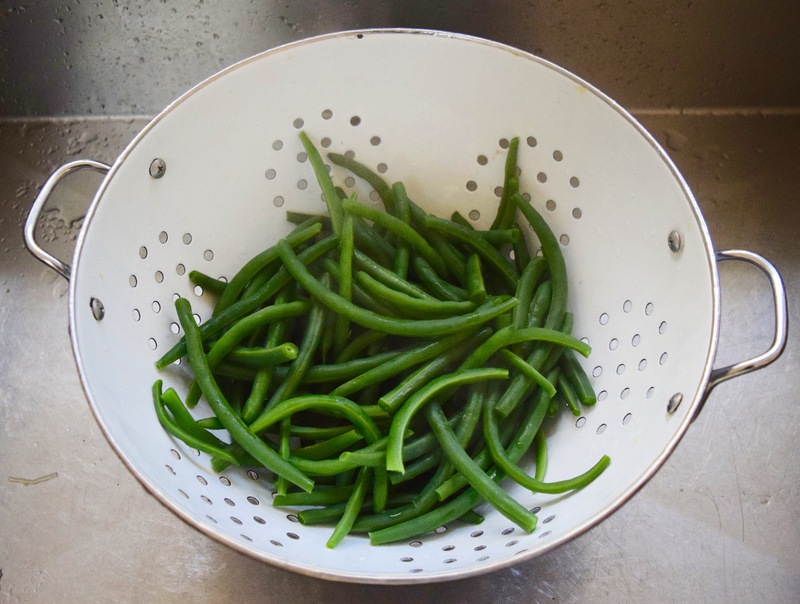 Remove florets from heat and drain through a colander. Leave florets in the colander and cover. Allow to steam, covered, for at least five minutes. The beauty of this method of cooking the florets is they will be uniformly cooked and not mushy or waterlogged. First, add eggs to a mixing bowl and beat. Add everything else but the flour and mix for about 30 seconds. Add flour and mix for about 15 seconds more. The reason to add the flour last is you don’t want to “awaken” the flour’s gluten by mixing it too much. Add cooked and cooled cauliflower to the egg mixture and gently stir with a spatula until the cauliflower is well coated. 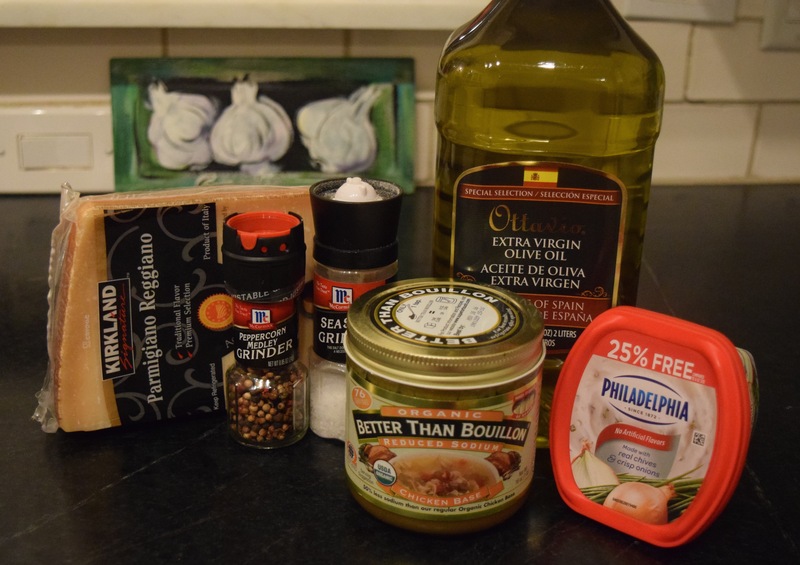 Fill a 12-inch sauté pan with about one cup of olive oil. You will be sautéing the vegetables, not deep-frying them. Set the heating temperature to medium. Let oil heat for a few minutes. Do not let the oil get smoking hot. The best way to test if the oil is hot enough is to dribble batter into it. If the batter sizzles, the oil is hot enough. If the batter immediately turns brown, it is too hot. In that case, remove the pan from heat and let the oil cool down some. If the oil is too hot, the interior of the patties will remain doughy while the exterior turns crisp. If the temperature isn’t hot enough, the batter will become like a sponge, sop up the oil, and the patties will taste bland. Plan on the patties cooking for a total of four to five minutes. 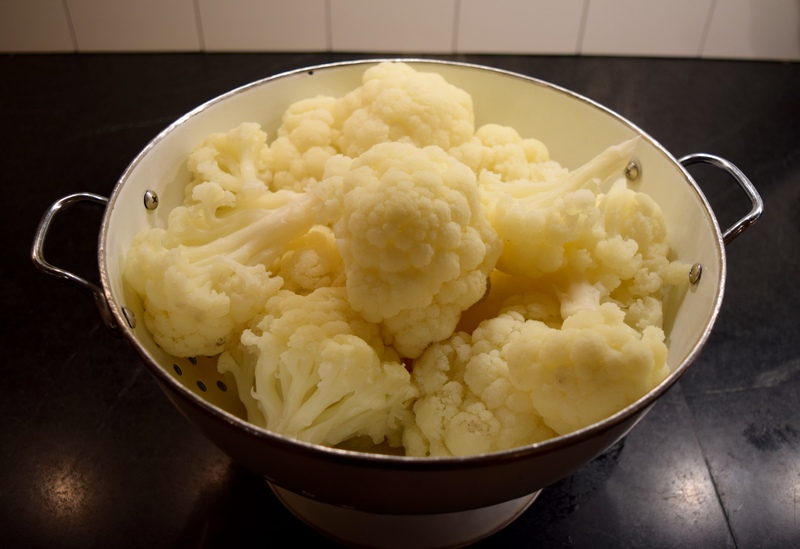 Remove cauliflower from pan with a slotted spoon. I tap the spoon against the inside edge of the pan to release as much oil as possible. Drain cauliflower on paper towels. This recipe makes three batches of six cauliflower patties. Serve hot, warm or cold. They are amazing at any temperature. When they are still warm, I like to squeeze lemon juice on each one before I eat it. I think it catapults the flavor to another level of deliciousness! My relatives, who have made these for a lifetime have assured me there will come a time when I will be able to make the batter without measuring it, as they do. Paula gave me the best advice about the consistency of the batter: “the batter should be thick enough to coat the cauliflower and still allow it to run off slowly like pancake batter would.” She also starts off each batch by frying a little of the batter (without cauliflower) to taste test if she’s gotten the batter’s seasonings correct since she makes her batter with Bisquick and without measuring the ingredients. A photo of my grandparents. Grandma made all of her aprons. Follow my photos of vegetables growing, backyard chickens hanging out, and dinner preparations on Instagram at JudysChickens. Never miss a post: sign up to become a follower of the Blog. 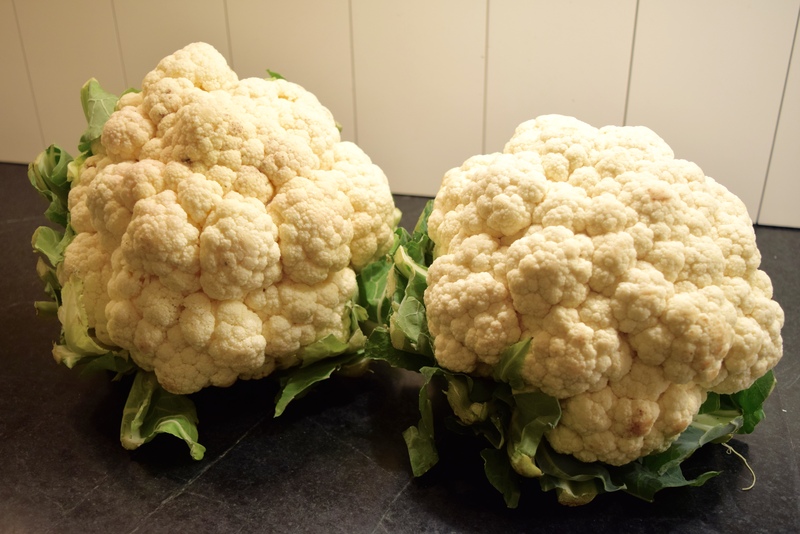 What do you do when you walk into a farm stand and see the most gorgeous, pearly white cauliflower you have ever seen in your life? You buy two, ignoring your husband’s raised and questioning eyebrows. They are each ten inches high. He knows there is no room in the fridge, but you can’t help yourself; their color and texture are gorgeous. My mother always said, “Buy what you love and you’ll always find a way to use it.” She was talking about decorating her home and purchasing clothing accessories, but I feel the same way about vegetables. I found the cauliflowers at my favorite Mennonite farm stand, Garden Patch Produce located at 1515 Buffalo-Cerulean Road in Cadiz, Kentucky. 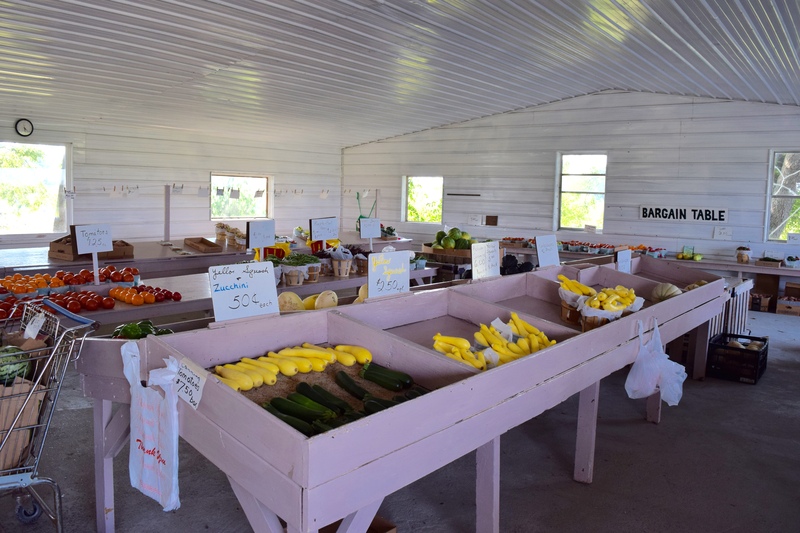 Do not bother to Google it as this electricity-free community of farmers adds up purchases with tally marks, so you can be sure they don’t subscribe to any form of electronic or print advertising. Note the “Bargain Table” along the back wall. It is full of yesterday’s vegetables at half price. There is no refrigeration in the building, so they don’t sell yesterday’s produce with their fresh produce. 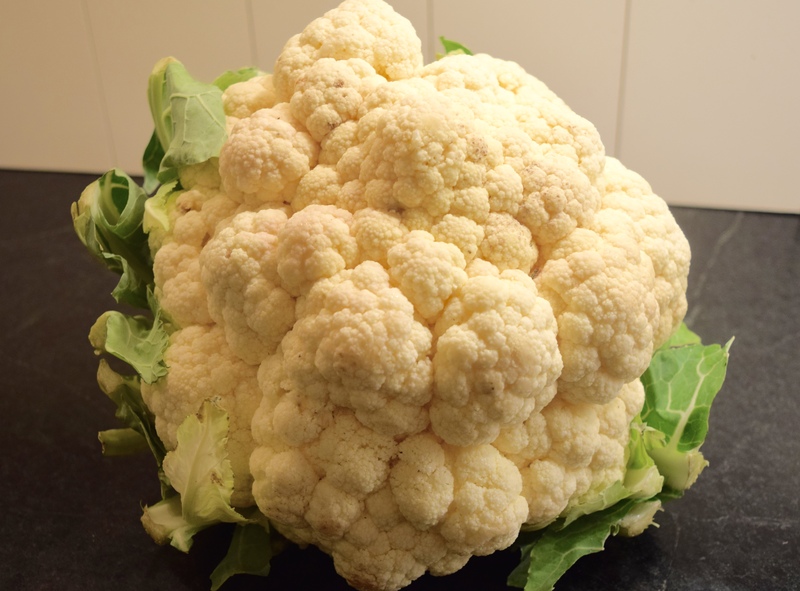 To Roast, Blanch or Saute the Cauliflower? That is the question. That is the question I ask when I look at any vegetable when I’m getting ready to cook dinner. Regardless of which cooking method you choose, you’ll first need to prep the veggie. 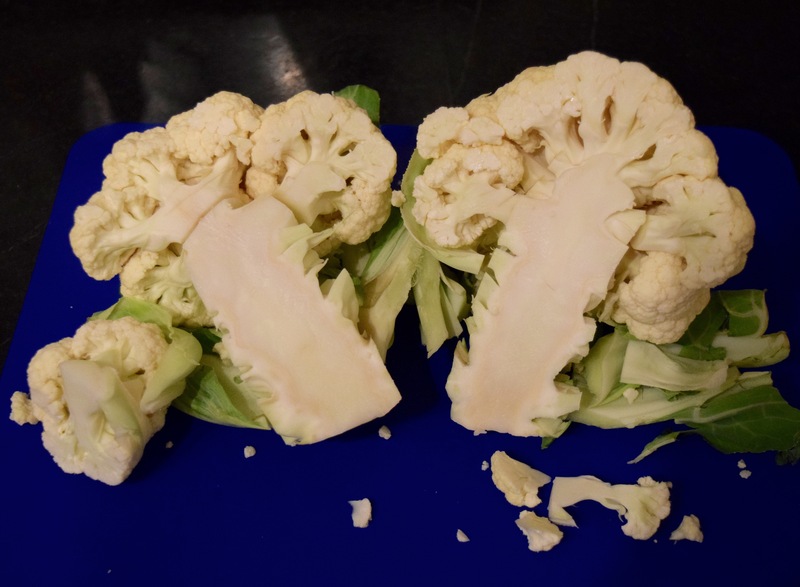 In this case, after washing the cauliflower, cut it in half and carve out the center core. As you do this, the florets will detach from the stem. You’ll need to chop the large florets in half for even cooking. 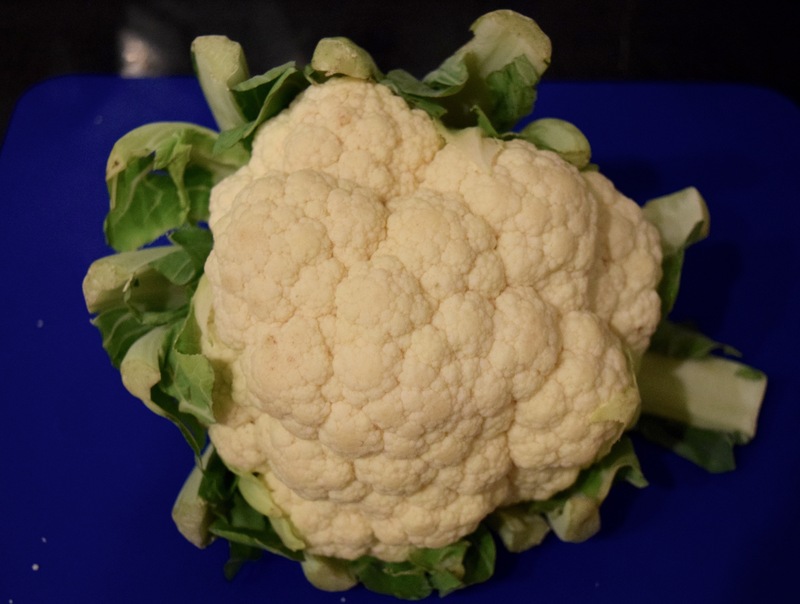 One of the extra-large cauliflowers yielded three pounds of florets. It took two two-pound cauliflowers from Kroger to yield the same amount. 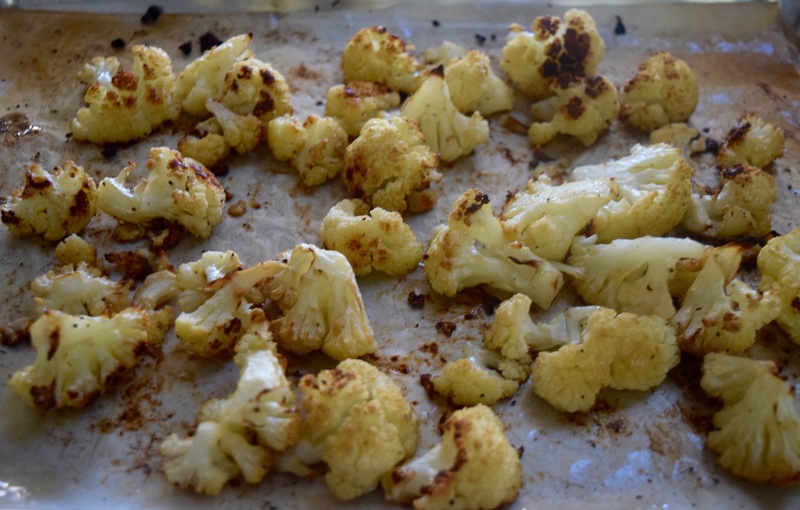 Out of habit, and because it is easier, I decided to roast one of the cauliflowers. I roast most vegetables in a hot 425º oven for about 30-45 minutes. 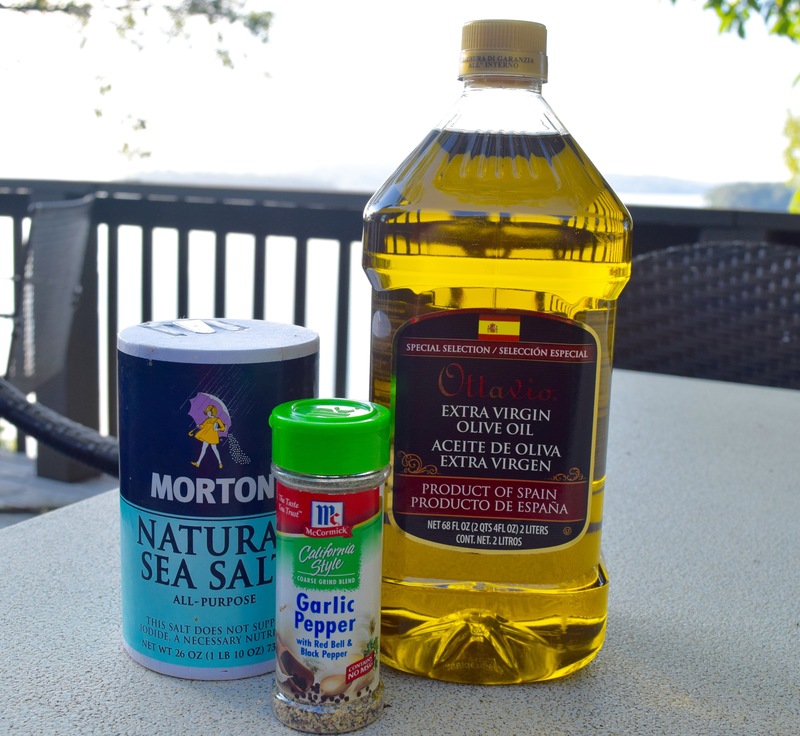 I season them with these three ingredients that you may recognize from my blog posts A Simple Everyday Salad Dressing and Easy Roasted Salmon. Chop the florets so they will all be about the same size for even cooking. Mix florets in a large bowl with 1/3 cup of olive oil and 1 teaspoon each of sea salt and garlic pepper. Toss until florets are well-coated. I tend to be heavy-handed with olive oil, and 1/3 cup is the minimum amount I would typically use. Bake on a parchment paper-lined baking sheet at 425º for about 40 minutes. Toss once or twice while roasting to encourage even browning. Roasted cauliflower should be called Disappearing Cauliflower or Gone in Sixty Seconds Cauliflower. When you roast vegetables at high temperatures like this, they caramelize as they cook and their natural sweetness emerges. It becomes like eating candy; you can’t stop until they are all gone. 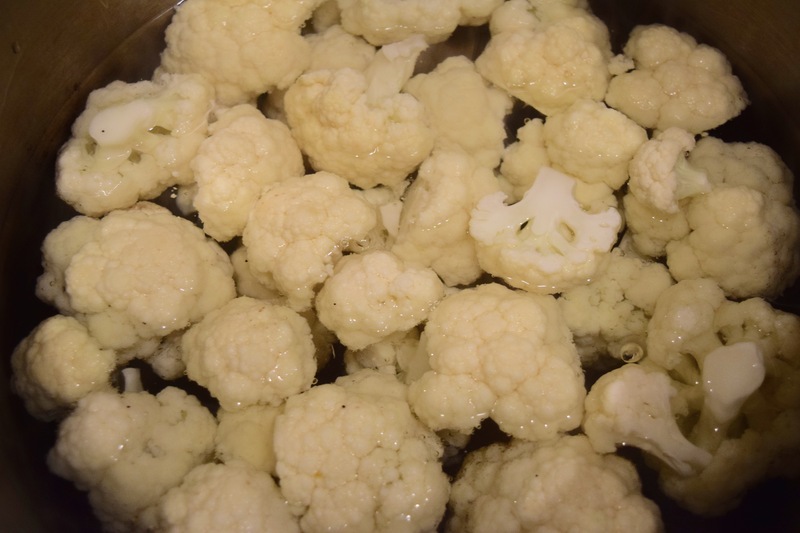 Officially, blanching is a method of cooking vegetables quickly by putting them in a pot of salted, boiling water for a short amount of time and then, if desired, plunging them into a bowl of ice-cold water, a technique known as “shocking” which halts the cooking process. I hardly ever do the shocking step unless I’ve lost track of time, allowed the vegetables to boil too long, and need to stop them from cooking any longer and changing color to blah. Why and when would you blanch a vegetable? 1) To retain color. 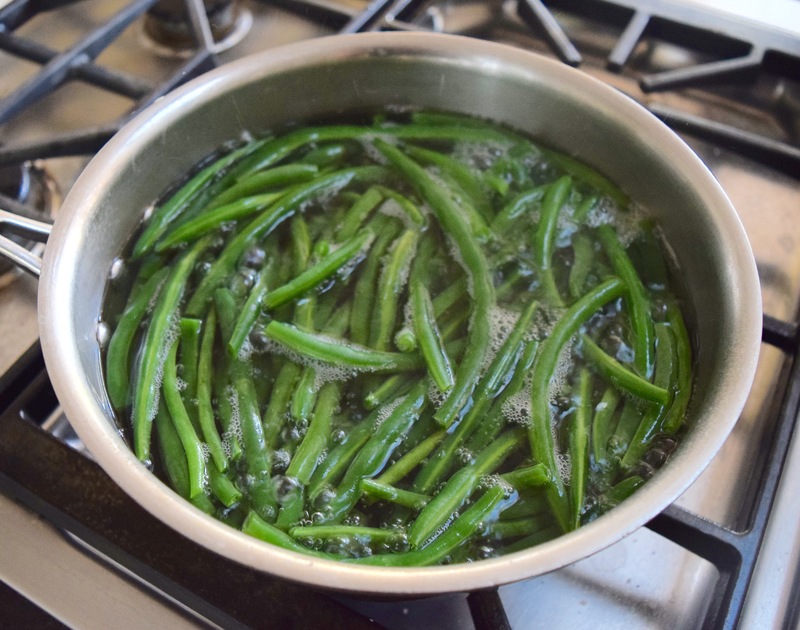 Blanching string beans, for example, “fixes” the color as bright green. Alternatively, if you were to boil them for 15 minutes, they would turn that army green color that may not be as appealing. 2) To achieve “fork-tender” texture. Blanching cooks vegetables quickly so they don’t get water-logged, mushy and tasteless. Blanched vegetables are usually firm, hold their shape, and if you poke them with a fork, the fork tines will slide in easily indicating doneness. 3) To loosen the skin off of a vegetable or fruit. Let’s say you want to peel a lot of tomatoes, or peaches, for canning purposes. An easy way to do so would be to boil them and then move them into a cold water bath. The skin will simply blister off. 4) To prepare vegetables for freezing. 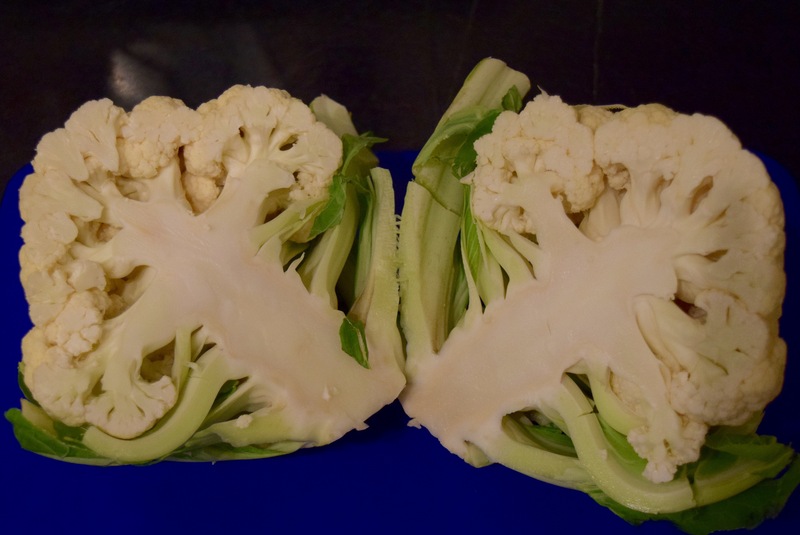 Blanching destroys enzymes that cause color, texture and flavor deterioration. 1) Fill a large pot with hot water. 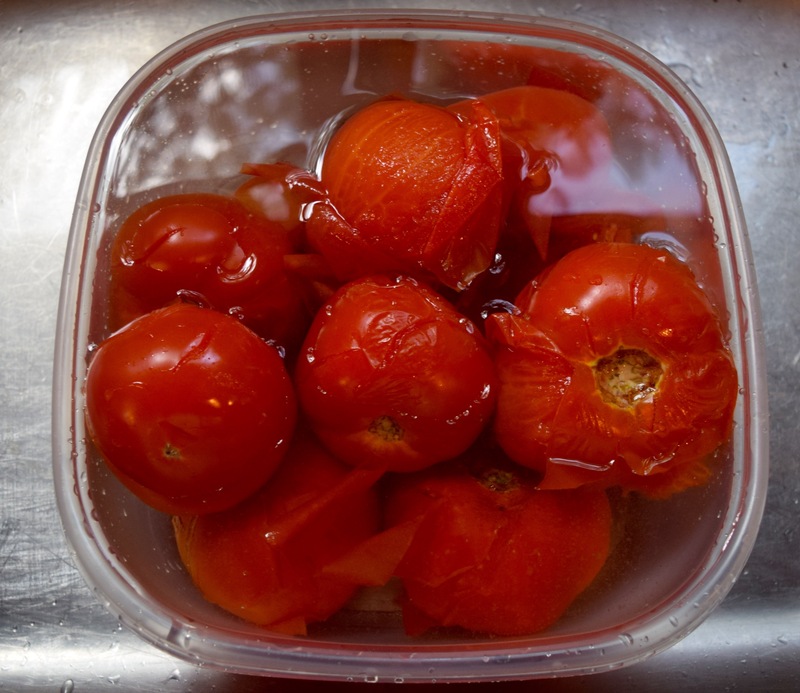 You’ll need enough water to cover the vegetables you plan to cook. 2) Add one tablespoon of salt to the water. Bring water to a full rolling boil. 3) Add washed and chopped vegetables, cover, and bring water to a second boil. It could take 3-5 minutes for the water to return to a boil. Once the water returns to a rolling boil, set your timer and cook for one minute. 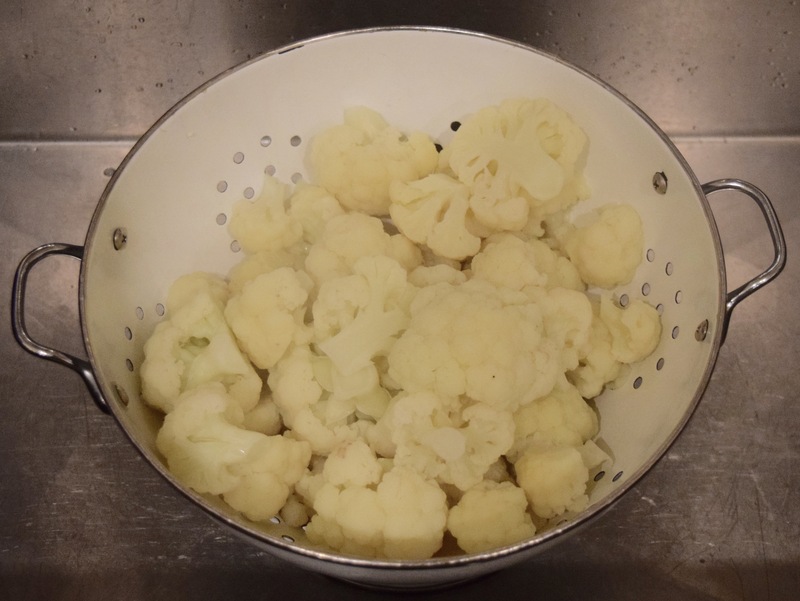 4) Remove vegetables from heat and drain in a colander. Let vegetables stay in the colander for five minutes. Vegetables will continue to cook as they steam in the colander. 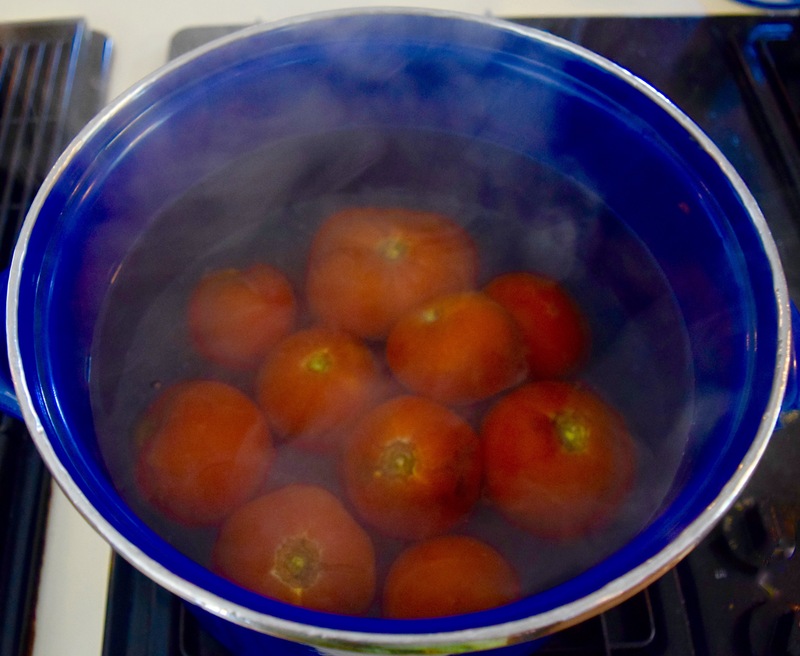 The steam will also evaporate the moisture around the vegetables. If you do not wish for the vegetables to continue cooking, shock them in a container of cold water. 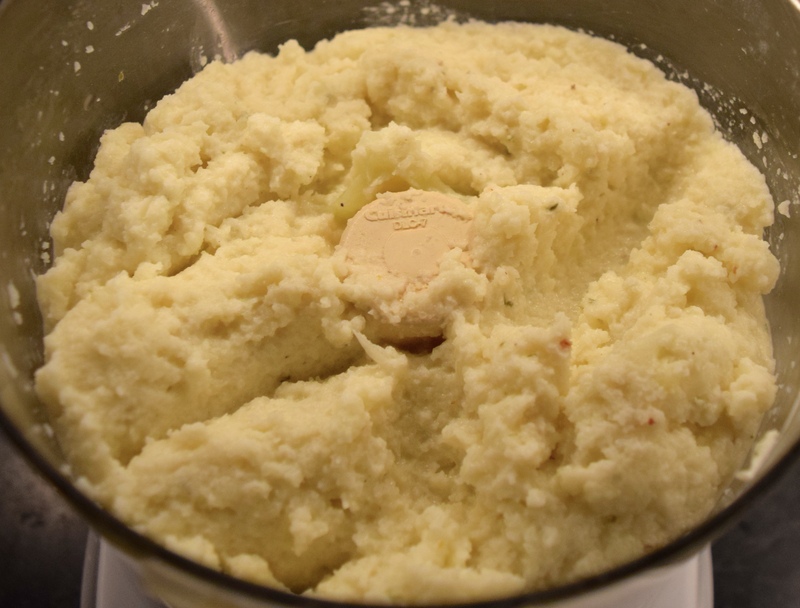 I’ve been hearing a lot about mashed cauliflower lately and decided to try making it. I read about five different recipes and came up with my plan. I had to tweak the plan quite a bit to get it to taste right. Let’s just say I now know my chickens like smashed cauliflower! Put cooked florets in the food processor. I could only fit about ¾ of the florets in the bowl of my processor. Add olive oil, cheeses, chicken broth, salt and pepper. Process until chunky and then add remaining florets to the mix. Process until it looks like mashed potatoes. Serve hot. You may need to heat it up before serving as the mixture tends to cool down quite a bit in the food processor. I used cream cheese with onions because I already had it in the refrigerator. You could use plain cream cheese and add chopped herbs instead. I used chopped garlic chives as a garnish. Whole30 has a version of this that includes 1/2 cup of coconut cream instead of other dairy products. Additionally, any Whole30 recipes that call for ghee, I use olive oil instead.